By Kelly Flynn/ The Sun: Stuart Harting, chair of the Haddonfield Outdoor Sculpture Trust, admires the latest piece from artist Seward Johnson titled “Contact.” The piece by artist Seward Johnson features a man and woman embracing with a suitcase near their feet. 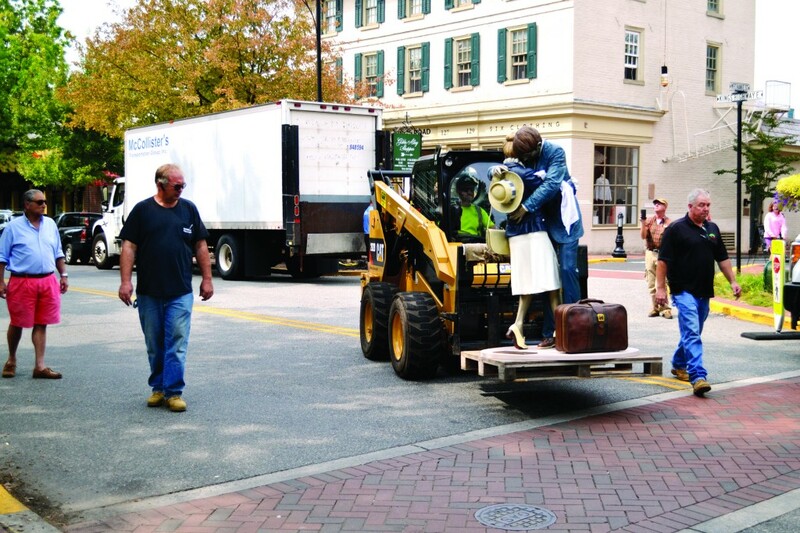 For almost 18 months, sculptor Seward Johnson’s “Crossing Paths” and “Weekend Painter” inspired double takes from people walking along Kings Highway and Kings Court. When the pieces were removed in March, the Haddonfield Outdoor Sculpture Trust was inundated by residents lamenting the pieces’ departure. For that reason, Stuart Harting, chair of HOST, was eager to get another Johnson piece in town. On Tuesday, Sept. 12, “Contact” by Johnson was installed in Kings Court. The piece featuring a couple embracing put a temporary stop to traffic along Kings Highway as Haddonfield public works transported the sculpture to its temporary resting place for the next several months. Harting said since its installation, “Contact” has generated just as much attention as “Crossing Paths” — or ‘the bench ladies,” as he said it was known to some — once did. HOST chose the piece from a group of sculptures the Seward Johnson Atelier offered to loan them. Jenée Castellanos, associate curator at the Seward Johnson Atelier, said the piece is part of Johnson’s series titled “Celebrating the Familiar,” which consists of lifesize sculptures that fit into the ongoing activities of the contemporary world. The Atelier has 150 pieces on loan in cities throughout the United States. Castellanos said the Atelier’s desire for Johnson’s sculptures is to familiarize and educate people on the benefits of art in the public realm. “We have so enjoyed having sculptures in Haddonfield and have always felt embraced by the community’s enthusiasm for public art,” Castellanos said. Harting said “Contact” will remain in Kings Court through the winter. He said HOST is still eager to get “Crossing Paths” back — either on loan or to purchase. The piece costs approximately $150,000 to purchase and is on a two-year tour along with other pieces from the Atelier. Harting said HOST has been fundraising — though not specifically for “Crossing Paths” because he doesn’t anticipate the bronze ladies coming back from their tour anytime soon. “Until we have a definite date that we can bring them back, we’re just going to bide our time,” Harting said. To find out more about the Haddonfield Outdoor Sculpture Trust, visit http://haddonfieldsculpture.org.